Called as “Congressmen” by the Rev. 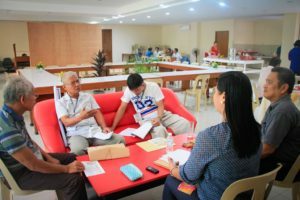 Antonio Reyes, LCP President, a total of 28 evangelists and pastors, one deaconess and one lady lay person, from North Luzon to Southern Mindanao gathered and revisited the evangelism program of LCP. The event was held last July 12-14, 2017 at the Lutheran Center, Sta. Mesa, Manila. In their “privilege speeches” the “Congressmen” narrated the different activities being done by their respective congregations. 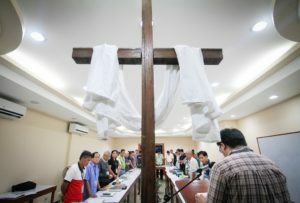 In some congregations, such as the Chi Ro Lutheran Church, Pastor Crispin de los Santos lamented that their time to travel to their outstation in Gapan, Nueva Ecija, done once a month, was more than the time spent in their mission area. The same is true with the travel spent in going to serve Munoz, Nueva Ecija by Pastor Henry Paul Roa. In Tagaytay, Tagalog bibles are needed and the members there need livelihood assistance according to Pastor Ike Agcaoili. 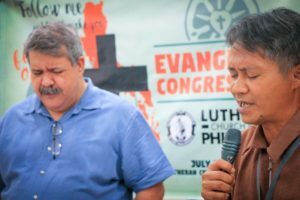 In Leyte, Evangelist Boy Fernandez said that people there complain about the Lutheran liturgy and hymns because they cannot understand it. Soon-to-be Deaconess Divina Fausto of St. Stephen Lutheran Church, Baguio City, shares about their Mission and Evangelism programs and experiences during her Privilege Speech in the LCP Evangelism Congress 2017. Biblical teachings on evangelism were explored on the second day. The Congress was blest with the lectures of Rev. Ruben Caldito on what the Bible teaches on Mission and Evangelism, by Rev. James Cerdenola on Evangelism and Discipleship and by the Rev. Teodorico Taran Jr on Evangelism and Stewardship. Rev. Taran particularly emphasized the importance of the pastor’s leadership role in evangelism. The participants were divided into groups to suggest strategies, policies and activities for the Mission and Evangelism Programs of LCP that will be presented / proposed in the General Convention. On the third and last day, break out sessions by five groups produced strategies and activities that would help in evangelizing. The groups recommended the creation of an evangelism committee by congregation, translation of materials, publication of tracts and pamphlets and new approaches for VBS and camps; building relationships with people in the community; training of Sunday School and VBS teachers; revival of the Department on Parish Education; production and distribution of tracts and pamphlets; inculcating evangelism in every church activity such as VBS and youth camp; reaching out to informal settlers, and t-shirt printing. Pastor Emmanuel Ilagan proposed the institutionalization of a bi-vocational ministry, meaning a church worker can be ordained as pastor even if he has a paying job. He also proposed a training on one-on-one evangelism. 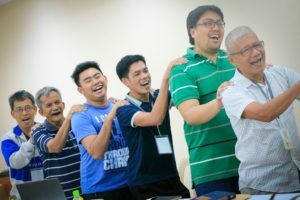 The participants having fun through singing and dancing during the LCP Evangelism Congress 2017. Moved by their burning desire to become a leading missionary church in obedience to the Lord’s commandment to go and make disciples of all nations everyone aspired to have an understandable and sustainable outreach program. Understandable, because people would appreciate more a message in the local dialect and sustainable, because they want to bring people to church and become regular members. The Congress decided to make this as the national evangelism goal. To do this, there is need for improving communications and making use of social media, cell phones, newsletters, advance announcements of activities, emails, snail mails, phone calls and word of mouth. Communicating plans, programs and activities is vital to have a sustainable program that is well supported by the members of the congregation. A closing prayer led by Rev. Raymundo De Leon of Mt. Sinai Lutheran Church, DRT, Bulacan. It was stressed that it is every member’s responsibility to evangelize since this is the mandate for every believer. In the LCP, the Evangelism Committee should mobilize members to do their part. Rev. 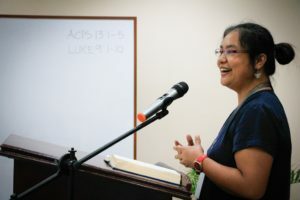 Reyes introduced the concept of formal and non-formal evangelism. Formal evangelism is done by the congregation as a whole. Non-formal evangelism is done by every member anywhere but is to start in his/her own household. The Congress agreed on the following strategies to implement an effective mission and outreach program: building relationships in the community, localizing instructional materials, distribution of Bibles in the dialect, distribution of tracts and pamphlets, training of Sunday School Teachers, VBS teachers and church workers, training of members on One-on-One evangelism, and institutionalization of the bi-vocational ministry. The latter to be submitted to the Convention for approval. To ensure sustainability, the Congress recommended for the creation of an LCP Mission and Evangelism Fund to be sourced out from pledges of congregations, portion of income from income generating projects of congregations, and setting aside a portion of income from LCP Main Office- Income Generating Projects to be remitted to the Fund. Jesus commanded us to go and make disciples of all nations. This is a command for every believer and the task of every congregation. As Christians, we cannot do away with this commandment from our Lord Jesus Christ. This is what the Congress want to re-emphasize. So to ignite everyone into action and make evangelism a personal goal, the Congress adopted the slogan “Misyon ni Hesus, Misyon Ko”. For more pictures during the LCP Evangelism Congress 2017, please click here. 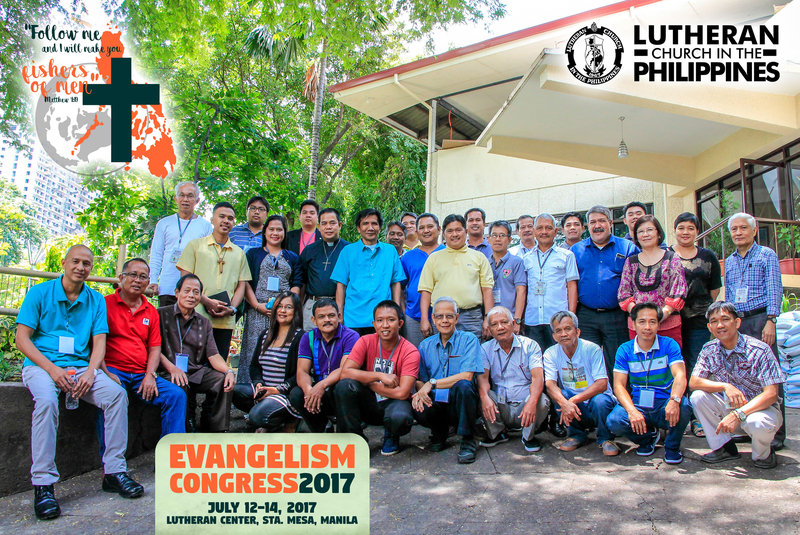 The participants and Resource Persons of the LCP 1st Evangelism Congress 2017 held in the Lutheran Center, Sta. Mesa, Manila. Ms. Arlene Z. Reyes is the Chairperson of the LCP Ways & Means Committee and presently assisting the Training Programs of LCP. She is also a member of the LCP Communications Team. Besides her various involvement in the ministry, she still manages to be a full-time housewife of LCP President, Rev. Antonio Reyes.